Dear oil companies, you’re screwing with Mother’s Day Brunch…. First, a big thank you to everyone who read yesterday’s post and left a comment, shared it on facebook or tweeted about it. There were some really honest emotions shared in reader comments and I am so grateful. The world keeps spinning and life goes on. We host a Mother’s Day Brunch every year. This year we’ll have about 18 people. Lots of folks wonder why I’d want to do hostess duty on what technically is my day. I love playing hostess. I love changing my theme each year. You can see previous years here and here). This year I am being hamstrung by the stupid economy and I am cranky about it. Being Italian, I obviously am genetically incapable of cutting back on my food budget for this event… That means my decor plans are going to take a hit. These are my party supplies. Come back tomorrow to see what I’m doing with them. Sounds like a blast. I love your attitude toward food budgets: never cut them! I’ll sell my home before I stop eating well! 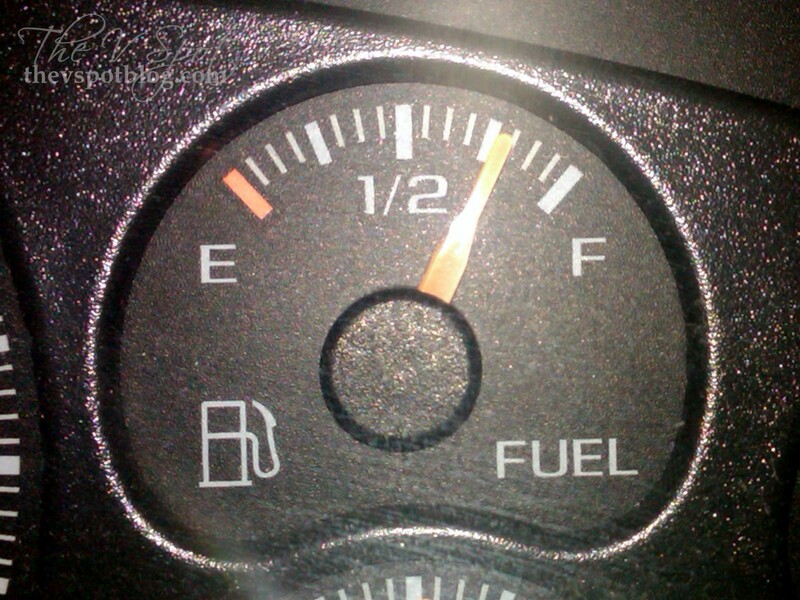 I am totally laughing.. the shot of your gas gauge was the only thing showing and son13 says “why is your gas gauge on the interent?”..I say “it’s not mine”..he says… “well it looks just like it”….. fast forward and I read your post and figure out why.. 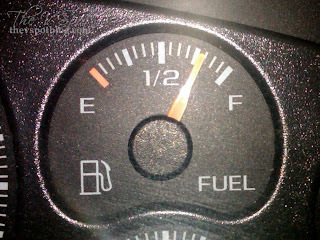 I also drive a Suburban… my grand total day before yesterday?…… $115 to fill up!!! Maddie, pondering a horse and buggy! Good luck! I’m sure you’ll pull together something fabulous. girl you are a trip.. I laughed at the title.. but ain’t it the truth? I can’t wait to see what you do.. you have gone all out in the past. I am hosting also.. the girl helping me at the deli ask,”isn’t this suppose to be your day”? Lol! girl that’s funny…but trust me it’s not the oil companies! My hubby works for one of the biggest ones in the gulf and trust me, they are not to blame for the high prices. But regardless, I know you will come up with something great! I know it will be difficult…but try and have a good time decorating! I am sure this isn’t your favorite thing to do…right??? Ha!! Thats awesome and I bet it would work for the coffee filter flowers too! Soooo much easier than dying all those coffee filters! Happy Mothers Day! I haven’t ventured beyond my immediate neighborhood for over a month. My SUV gets 11.8 miles to the gallon. But I look damn cool in it. Will the windows down because running the AC takes too much gas. Can’t wait to see what you do with your supplies…. I also drive an SUV. It KILLS!